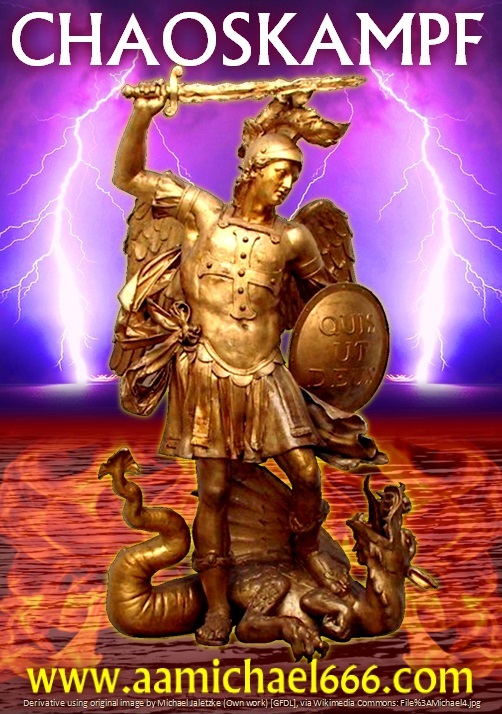 Ark Angel Michael is prophesied in the Book of Revelation from the Holy Bible, to destroy the Beast 666 and to subdue the Dragon for 1000 years. 666 is the number of a purely materialistic Man-god and system of World Government, which is about to announce itself as Executor of planet Earth under the guise of the United Nations ‘peace’ organization. The method which is being used currently by this system in order to bring about these plans, is Hegelian dialectic; by creating a never ending stream of problems, such as global terrorism, economic turmoil, and perceived problems such as anthropogenic global warming (or climate change, etc. ), this system is trying to take the world by force, because it cannot take it peacefully, so it deceives, and kills, and lies … and lies … and lies. Have you had enough of the deception? Do you need a little Ark Angel Michael in your life? Ask Jesus personally to send him your way, and to show you what you can do to quicken the 1000 year reign of Jesus Christ. This blog has been created to document the destruction of this 666 system as it continues to emerge out of the pit, to the day it falls apart and takes most of the world social order with it; but alas, a new and better order will arise from the ashes, and not the Order of the Phoenix that the anti-Christ system of 666 is trying to birth. The Phoenix is going back to the pit, where it belongs! Because life is like a chaotic ocean. We are all drifters, caught in a storm, looking for some dry land. Like Jonah we are at the peril of Leviathan, the ‘Beast from the sea’, but the Lord has a plan for many of us, a destiny we must fulfill before we find our Paradise. Search for your destiny, ask Jesus today to answer your deepest questions; ask him directly, one-to-one . . . He will listen and reply. Is 666 an evil number? Numbers by themselves are not evil, but human intent can be. 666 is actually a very special number, for many different reasons, and was in fact completely Holy until the day the heart of mankind was soured by temptation. Click on the image below, to read a seminal post explaining how 666 is an identifier for God’s marvelous creation, and why a coming man-god and his system covet this number identifier, to claim all of God’s creation as their own sovereign property. Carbon is #6 on the Periodic Table of Elements, and is the building block of all organic life on planet Earth. 99% of Carbon Atoms have 6-Protons, 6-Neutrons, and 6-Electrons, which is why Carbon Trading and Taxation is the last piece of the globalist puzzle required to setup a New World Order (a global plantation model practicing a technocratic system of eugenics, revolving around the atomic element of life itself). Ultimately, this coup against God will fail, and Michael will suppress these agents of Chaos just as prophesied, in the name of Jesus Christ; Lord of lords, and King of kings.
. . . please click on the below image to crawl into the rabbit hole . . . I just downloaded and printed only reading the first few pages before i did. I was hoping and expecting to eventually see Jesus’ name somewhere. I did. The culmination of the profound and exponential searching I have done involves the bad parts thoroughly explained by your work here, and ends with the source of all good, The Word Of God, Jesus Christ. Thank you for this. Even though i haven’t read it all yet, i can see by a glance it was a lot of work. You are most welcome. Please help me spread it far and wide if you can. I would have loved to have included more but there was not enough time. I will post future works God willing. What else do u know about aamichael? I’ve read the Daniel 12 reference.it sounds like an actual person. To tell you the truth Mike, I believe that all the Holy Angels are egregoric like forces that manifest through the Body of Christ. Even though Michael may indeed be a real person somewhere in Space-Time, just like Gabriel, he is an active participant in revealing the truth to people who have accepted the Holy Spirit and been accepted truly into the Body of Christ. It makes clear that the Beast that he lays chains on is a worldwide system, not something out of a H.P.Lovecraft Novel :). Thus Michael does his work in a macro way, which is only really visble to those like Daniel who can ‘see’ the vision, or destiny unfolding; there are many who are literally asleep and cannot see the truth of the spiritual battle going on. 666 is not the actual number of the beast. that number would be 616. my source for this is the dead sea scrolls. what is your source for the number of the beast being 666? The number 616 is not referenced in the OT, but 666 is clearly referenced in relation to Solomon, and his tribute/taxation. I interpret the Beast in Revelation to be a resurrected Roman Empire incorporating a false image of the Kingdom of Israel/Judea; as per the situation under Augustus and Herod the Great. Thus, a False Messianic system – Modern State of ‘Israel’ ? – in charge of the worlds financial system, is quite congruent in my opinion with a new Solomon extracting the symbolic 666 from the world population. Ask yourself: Who controls the current world financial system? Which ethnicity? Which ethnicity on earth hates the Christian Church more than any other? Answer this question honestly. It’s quite easy to (((answer))). Hi, what do you know about the Christchurch earthquake of 2011. Was it man-made?